While it probably will satisfy the minimum requirements of Star Wars franchise fans, so much of "Rogue One" is dull, dumb and (literally) dark that it often seems depressingly desperate. Oddly, many of the frenetic action sequences turn out to be the most tedious parts of the movie. Stormtroopers still have such poor aim that it's hard not to wonder if they even can see through their helmets, and the interminable aerial dogfights are about as engaging as watching somebody else play a videogame. The best thing about the film is deliciously deadpan new droid K-2SO (voiced by Alan Tudyk), a significantly less fidgety C-3PO who gets all the best comedy-relief lines. The worst thing is the rest of the ridiculously padded and boring screenplay, which boils down to "find dad and his blueprint." This painfully puny plot is stretched out to a mind-numbing 133 minutes…but if you're looking to maximize your entertainment dollar, be assured that the running time feels at least twice that long. The stunningly lovely Felicity Jones stars as Jyn Erso, whose luscious cupid's-bow lips, alluring eyes and consistently flawless makeup are somehow ignored by every male in the cosmos. Sure, she and her fellow rough-and-ready rebels are running around trying to topple an empire and all, but it's hard to imagine even a rusty robot not making a pass at such an irresistible beauty. Although billed as a standalone story, "Rogue One" actually is an immediate prequel to 1977's first "Star Wars" outing, setting up the events in that film. Jyn's father (a suitably somber Mads Mikkelsen, who also appeared in this year's "Doctor Strange") tried escaping the evil Empire, but has been dragooned back to the dark side to design the Death Star, every nerd's favorite weapon of mass destruction. His hiss-worthily nasty superior Orson Krennic (Ben Mendelsohn) manages to be even more vicious than returning baddie Grand Moff Tarkin (the deceased Peter Cushing, appearing by way of a rather remarkable CGI reincarnation). Where Krennic would be cool with destroying an entire planet as an initial demonstration of the Death Star's capabilities, Tarkin settles for only a single city. Tarkin is one of several returning original-trilogy characters, including a final creative cameo guaranteed to goad geeks into fangasms. The entire enterprise ends up feeling somehow hollow, however. 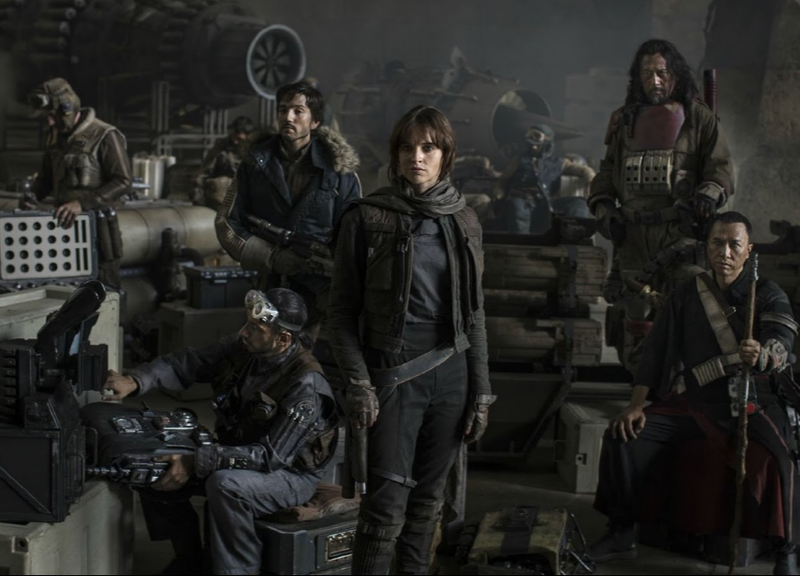 In the same way that this year's "Star Trek Beyond" played like an unengaging fanboy pastiche, "Rogue One" is another going-through-the-motions franchise filler that barely gets the job done. Director Gareth Edwards (who helmed 2014's abominable "Godzilla") lets the story drag in too many places. It doesn’t help that many of those scenes are so dark even in 2D that I can't imagine how bad they would look through 3D glasses. The only bright spots in the Chris Weitz and Tony Gilroy screenplay come from the sarcastic K-2SO, who is less persnickety than C-3PO but more endearingly annoyed than Marvin the Paranoid Android from "The Hitchhiker's Guide to the Galaxy." When rebel assassin Cassian Andor (a grimly no-fun Diego Luna) gives Jyn a weapon, K-2SO petulantly complains, "Why does she get a blaster and I don't?" He later responds to one of Jyn's remarks by stating, with amusingly peevish David-Hyde-Pierce-like matter-of-factness, "I find that answer vague and unconvincing." During a suitably ominous one-on-one encounter, Darth Vader (voiced as always by James Earl Jones) threateningly advises the conniving Krennic, "Be careful not to choke on your aspirations." It would have been nice if the "Rogue One" filmmakers, however, had aspired to something a little higher than this generic space junk.